Okay, we've established that you can build houses, businesses and other cool things to create a populated city. But now what do you do in the city? Here we go into the missions system! Racing, killing baddies and more! Read it all here! Okay, we've established that you can build houses, businesses and other cool things to create a populated city. But now what do you do in the city? 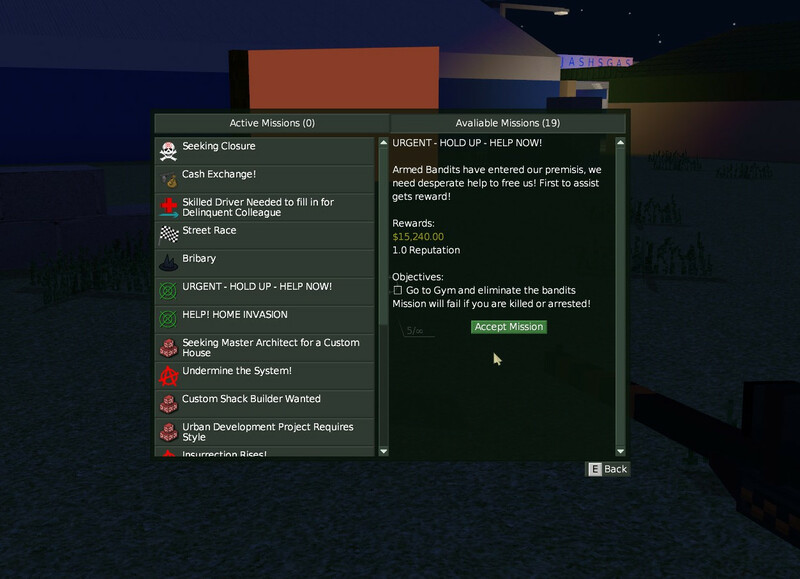 The mission system in Voxel Turf is there to give you things to do and a sense of direction without sacrificing the freedom to do whatever you want. If you are done building a house or shooting up bandits, or you are just after some more cash you can give a mission a go. You have a mission tab in your game menu, which contains a list of active and possible missions. Above: Today's video is a short racing mission! Yes you can do missions in Co-Op! When you do Co-Op every player participating gets the full rewards, so there is no reason not to team up! Furthermore, Co-Op uses a “lives” system, so if you're playing with a stupid friend who always tends to get shot in their stupid face you don't have to worry. Your party gets a “life” for every second player that joins the mission, so mission with two players gets 1 extra life, a mission with four gets 2, six players gives 3, etc. To set up Co-Op you must first ally the friends you intend to do missions with. Then when you select a mission you can either click “Call in All Allies” to bring all your allies into the mission. Or you can select a mission and then click “Invite (Player)” to invite players individually. Voxel Turf has over 40 missions spread over 11 different activity groups. Every now and again bandits will hold up a home or business. You can save the day and earn a quick bit of cash and reputation. There are 12 missions in this category, most of them are repeatable. Some of them involve eliminating small groups in buildings, some of them involve saving a Hospital or Department store from a major operation with a variety of weapons. 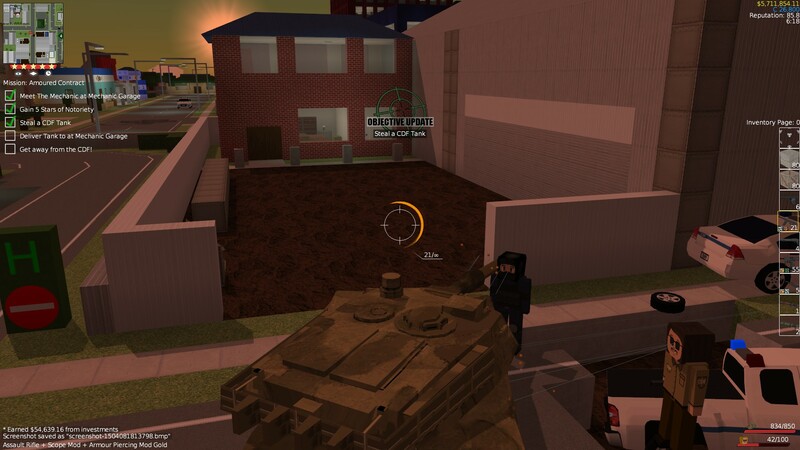 There are missions where you have to clear bandits off of rooftops and where you fight tanks in the streets! The game will generate a racetrack through the streets. You drive to the start line and then race against 4 AI cars to the finish. In Co-Op only one player has to win to succeed. There are 3 racing missions, the latter two are repeatable. You get to meet a eccentric gentleman called the anarchist. The region that the game has been played on has been without effective government for many years now, but this anarchy isn't anarchistic enough for him. He will issue missions to attack the CDF, mayhem missions, and missions to vandalise property. He has 8 missions of 3 types to give you. She has 3 bounty missions, and 2 missions related to getting retribution for her son's death. The mechanic likes to make some side cash by acquiring vehicles in less than conventional methods. In the beginning you will steal cars, but as you progress you will be required to pull off more dangerous capers. Above: One mission is to capture a Tank! The schemer will let on in on some particularly lucrative robberies, that's if you can pull them off! These involve raiding a gun shop, a jewellery shop and finally a bank hiest. He has a total of 3 jobs for you, if you can pull them off! A paramedic is always missing her partner due to a drinking problem. Help her rescue the various invalids with her ambulance. She has 4 driving missions for you, the last 2 are repeatable. 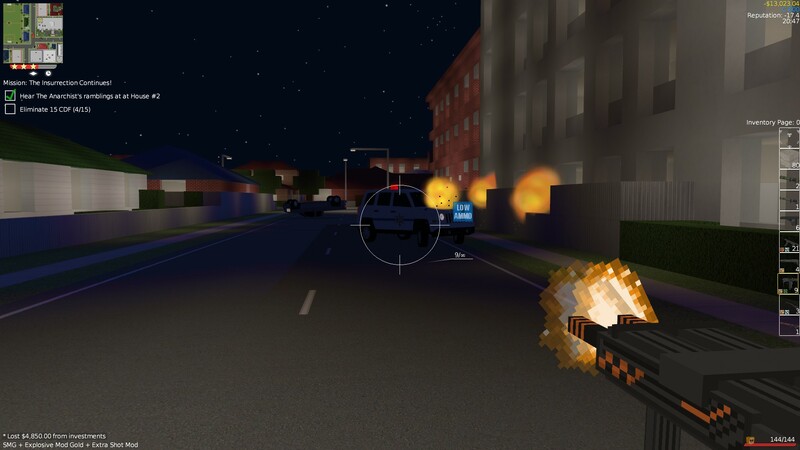 Later in the game the actions of the Anarchist start to turn against the city. Help the Cop restore order by defeating the anarchist's goons that have taken up armed rebellion throughout the streets of the city. There are 2 missions. The Mole will give you missions that don't give you cash rewards, but do give you reputation rewards and reduce the reputation of AI factions. These sometimes also increase the aggression of AI factions, making them easier to conquer. These missions are twists on the missions provided above. For instance, one is a racing mission, but one of the cats has been buffed significantly. They are also repeatable as long as there are AI factions still alive. There are 4 of these. Every now and again some people will issue a contract to build a custom building. You will get very well paid in both money and reputation for this. If the world is underdeveloped you may get missions to kick start industry or housing. Finally rewards increase as you level up. Each level gives you a 3% bonus to the cash reward. So even in the late game missions can give you some decent income! Add drugs to the economy please. There are not enough well developed drug mechanics in video games and it's an addicting way to see numbers climb but also a decent way to add risk and reward but also good excuses for action and enterprise/empire. good example: GTA Chinatown Wars. Throw in empire building elements like fronts, production and supply and runners and protection. >Throw in empire building elements like fronts, production and supply and runners and protection.